A zip-line is more or less just pulley and harness rig used to slide a tourist along a cable strung between a couple of trees or hillsides but there are big differences between tours. There are three distinct types and the descriptions below will help you pick which is right for you, or maybe convince you to try all three. 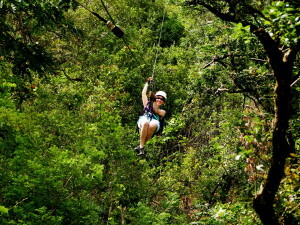 There are at least seven competing “-est” zip-lines each claiming to be the longest, highest, and/or fastest in Costa Rica. We have dynamic GPS data on each and know which is telling the truth but aren’t going to make enemies by calling a bluff. Other than marketing purposes it doesn’t really matter because they are all very high, fast and long. Most or all of the “canopy” aspect has been removed from these tours and replaced with thrills. Some include short walks on trails but others (Sky Trek in Arenal and Monteverde) include a ski-lift style gondola to the top of the mountain. All have steel platform towers replacing the trees of the original canopy zip-lines (see below) and the cables cross entire valleys so high up that the forest looks like a green Berber carpet in the distance. The big amusement park style super zip-lines are almost non-stop. You no sooner land on a platform than your pulley is latched to another cable and you’re launched off the other side. There are a couple of reasons for this. First, the faster people fly down the production line the more money the tour makes. Second if you don’t have time to think about it you don’t have time to freak out and bail. If a tourist decides they don’t want to fly down a kilometer (0.6 miles) long cable 200 meters (650 feet) up at 60 kilometers per hour (40 mph) the courses do have bailout trails but it’s very expensive for the operation. The tour has to provide a guide to walk the tourist out on what can be a challenging and difficult hike – 1 km in 64 seconds “as the crow flies” may translate to 2 or 3 km and a couple of hours walking on very steep trails. If the sight of more than half a mile of cable disappearing into the clear blue sky in the distance pumps you up instead of freaking you out the big commercial operations can up the ante one more time with a “superman” flight. Face down and head first adds another dimension and a bit more speed since the position is more aerodynamic. If the zips don’t offer enough adrenaline the big operations offer other gravity powered thrills like Tarzan swings (basically just the biggest rope swing ever) and bungee jumping. All of the big operations offer individual go-pro helmet cams and employ professional videographers and photographers to document your adventure from top to bottom. DVDs and wi-fi transfers to your device on sale at the photo booth at the end. A inventor named Buddy Quattlebaum has added a couple of new adjectives to the -est list – hilliest and curviest. His new ride called “El Avatar” located at Manuel Antonio uses a rail to guide the pulleys and harness on a course that curves both up and down as well as side to side on a path reminiscent of an aerial roller coaster. 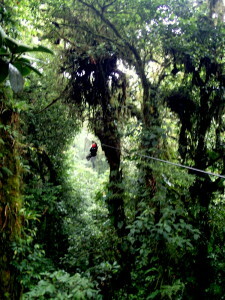 Zip-lines started out as a way to explore the rain forest canopy but the “longer, higher, faster” tours (see above) string cables so high that riders may barely be able to see the treetops whizzing by below. Many smaller canopy tours offer a slower relaxed pace, more personalized attention, naturalist guides and a more intimate look at the forest and canopy. With nearly a hundred small operations in Costa Rica there’s a lot of variability but most of the tree-to-tree canopy zip-lines have features in common. Obviously from the name we’ve chose to give them they often have platforms and cables that attached giant rainforest trees rather than steel towers. Some also include launch pads on the ground at the top of hills. 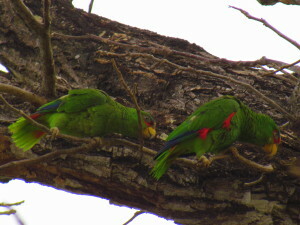 Many of the best are set in private forest or wildlife refuges (Trogon Lodge in San Gerardo de Dota, Flight of the Toucan at Hacienda Baru, the Original Canopy at Monteverde Cloud Forest Lodge) and include hiking along improved trails or paths to reach the high point and moving between zips. 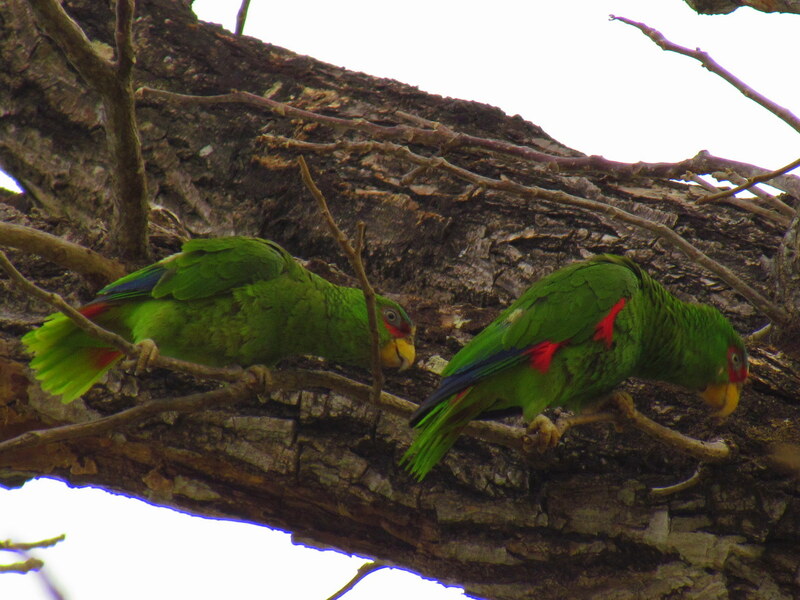 As a rule they have fewer visitors every day which often leads to smaller groups. We’ve been on several where the two to five people in our group were the only tourists zipping along the course with three or four guides. Smaller groups tend to eliminate the production line and give riders time to look around and the guides time to point out birds, animals and interesting features of the rainforest. Occasionally we’ve found that the smaller zip-line tours have a bit of an inferiority complex about not being -est anything (longest, highest, fastest…priciest) and work so hard at emphasizing the “thrills” they forget to mention the wildlife. Tell your guides at the start that you really love birds and wildlife and they’ll be much more likely to hunt some up. If you want extra thrills sometimes the smaller tours can accommodate that too. You may have to sign an extra waiver but variations like the spinning top or upside down and backwards descent might be on the menu. 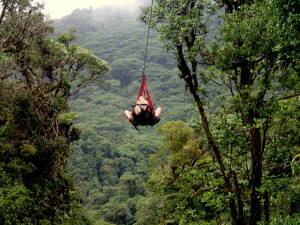 While zipping is probably never the ideal way to see wildlife we’ve seen owls, margay cats, other extremely rare and difficult to find species along with monkeys, sloth and loads of birds on smaller zip-line courses. Even without an -est factor smaller canopy zip-lines do offer thrills. You may only be going 35 kilometers per hour (22 mph) but it seems a lot faster when you’re in a narrow tunnel inside the canopy with leaves and branches flying by inches from your face. Twenty five meters (80 ft) up the trunk of a tree may seem like nothing compared to hundreds of meters above the valley floor on a “big” tour, but when the tree starts swaying in the wind the faint of heart may wish they were on a good solid man-made steel tower instead. The last type of zip-line tour is our personal favorite. Honestly even the longest, highest, fastest zip cables get a bit mundane after five or six rides (most courses are around a dozen cables) and even though Costa Rica claims to have invented tourist zip-lines it’s been far outdone in every -est category elsewhere in the world. If you’ve already ridden a 3 km long, 75 kph cable through the mist in Scotland you may want to try a multi-sport tour instead. 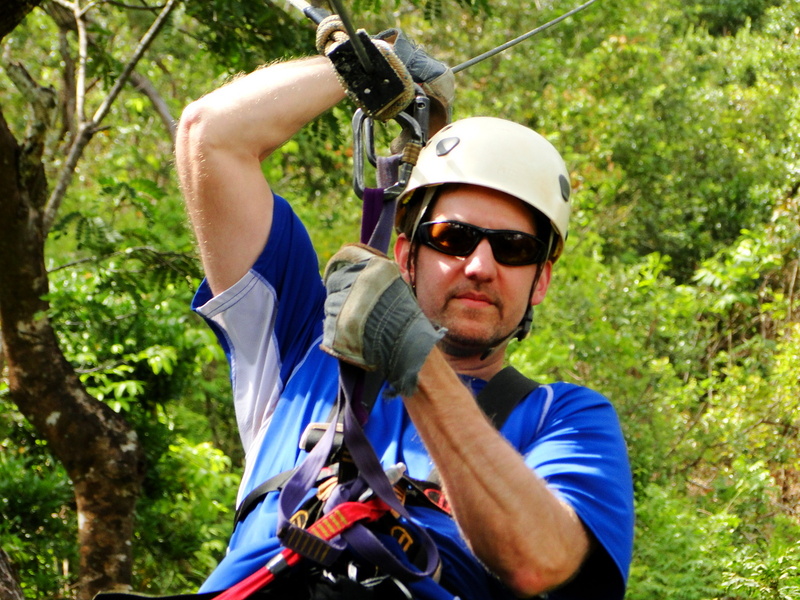 These tours often include only a couple of zip-lines (still enough to get the experience) combined with other adventures usually set in a canyon above a river. Depending on the location they may include rappelling (inverted if you want – see video below), rope swinging, horseback riding, rock climbing, cliff jumping, swimming, waterfalls and tree climbing. 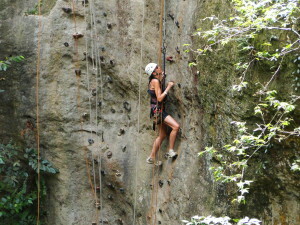 The zipping part can range from one or two cables like at La Roca near Arenal or at Hacienda Guachipelín to a location like Vista al Golfo above Miramar which has a couple of rappels and a waterfall to swim under but a dozen cables to zip over other waterfalls and the canyon. 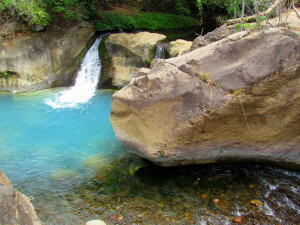 Waterfall swimming hole at the bottom of the zip-line course. One of the newest zip-line course at Río Perdido doesn’t quite qualify as multi-sport (they only have a small rope swing but plan to add more canyon features) but it does offer a unique finale. Soaking in a series of hot spring pools and under little waterfalls in a volcanically heated river. Whether you collect them like famous roller coasters or have never tried a zip-line Costa Rica has some of the best cables in the world and no two are the same. If on the other hand even the tamer versions of zip-lines sound too terrifying for your tastes there are other ways of getting into the canopy in Costa Rica. Canopy bridges (hanging bridges or puentes colgantes in Spanish) allow you to explore the tree tops on foot and offer much better birding and wildlife watching.